The guys at X-bit labs (you know, the guys that publish old news for fun), have this time published a more serious article about Thermalright’s Spitfire VGA cooler and VRM-R5 heatsinks. You can read the complete article HERE. VRM-R5 is a model of VRM heatsink especially developed for use with Spitfire GPU cooler. 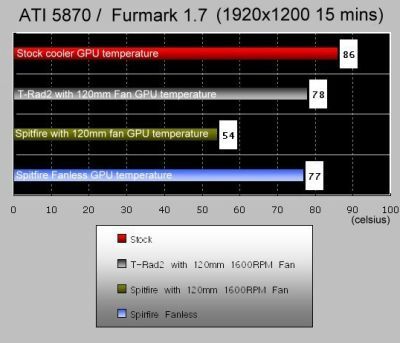 If we use FurMark to load the graphics card working at its nominal frequencies, then the temperatures will exceed 100 °C very rapidly and we will need to terminate the test manually. The same occurs when we try using a passive Thermalright Spitfire inside a closed system case (even f the ventilation inside is properly organized), but this time any type or intensity of load will do the trick. At the same time we can assume with all certainty that it is quite possible to have Spitfire cooler in passive mode cope just fine with mainstream graphics accelerators. But if you add a 140mm fan at 900RPM, the Radeon HD 5850, cooled by the Spitfire + VRM-R5, successfully passes the FurMark torture test. 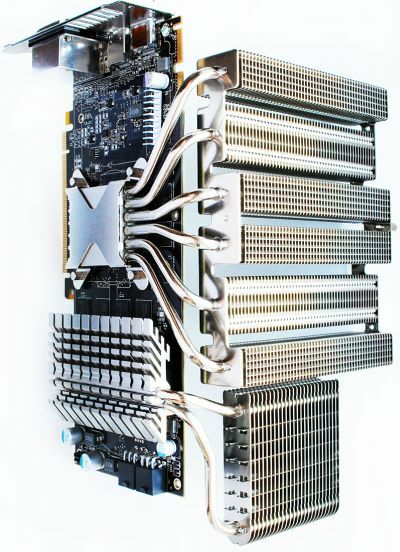 Thermalright Spitfire is an undefeated leader in terms of Cypress GPU air-cooling. It demonstrates astonishing advantage over the competitors. 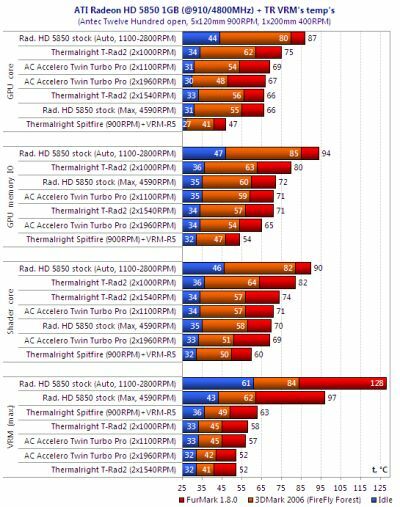 It would be enough to say that Spitfire cooler equipped with a 140 mm fan at 900 RPM cools the graphics processor under FurMark workload the same way Thermalright T-Rad2 GTX and Arctic Cooling Accelero twin Turbo Pro do with both their fans at maximum rotation speed. And most importantly the same is true for the load created by 3DMark2006, too! Excellent cooling efficiency, great job, Thermalright! At the same time I have to say that the voltage regulator components on the overclocked Radeon HD 5850 cooled by Thermalright Spitfire and VRM-R5 heatsink run hotter than in case of two alternative coolers bundled with VRM-R4. 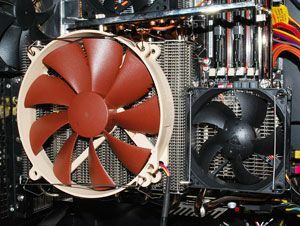 The explanation would be pretty simple in this case: both – T-Rad2 GTX as well as Accelero Twin Turbo Pro direct the airflow towards the graphics card, while the Spitfire fan blows the air parallel to the card. On the other hand, even the peak temperature of 63 °C on the voltage regulator components during FurMark test is not something you should really worry about. LOL… this is the tooo cold.!!!! !